PRESS RELEASE: Monday 14th September marks the launch of the Soundsurf 09 Tour - a new initiative encouraging young people to engage with music making, supported by Gibson Guitar, Pure Solo, UK Music, Hard Rock Café and The British Music Experience. The Soundsurf tour will run between September 14th -17th, and travel to Folkestone, London, Cardiff and Manchester, via the exclusive Gibson Guitar Tour Bus. By day, the Gibson Guitar Tour bus will park up at schools and colleges, hosting free workshops with music industry professionals and undergraduates from Canterbury Christ Church University. In the evening, the bus will travel to Hard Rock Café's where local musicians can showcase their talent at open mic nights. Event organiser Julia Jones of Music Hub explains: "The premise of Soundsurf 09 is for budding young musicians to gain knowledge, share opinions, make contacts and showcase their talents. But rather than come to the industry; the industry, via the Gibson Guitar Tour Bus, will be coming to them. Now more than ever, it is vital that emerging artists understand the business side of music, so they have an enjoyable career within the industry rather than a stressful one learning from expensive mistakes. 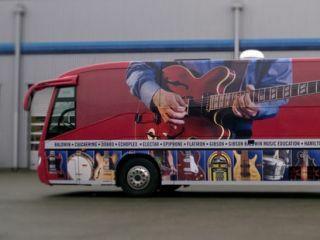 "At every stop, the Gibson Guitar Tour Bus will kickstart a variety of activities, workshops and showcases revolving around music making and creativity. I would urge anyone with an interest in music in the Folkestone, London, Cardiff and Manchester areas to roll on up and get involved." The Soundsurf 09 Tour also provides the launch platform for a national lyric-writing competition, inviting the UK public to re-write the lyrics to Natasha Bedingfield's hit 'These Words'. Uploaded onto a special www.PureSolo.com/soundsurf09 website, the best two judged entries will each receive a Gibson Les Paul Studio electric guitar and tickets to the British Music Experience at The O2. The tour, launched as part of the Department of Children, Schools and Families National Year Of Music Initiative, has the support of figures across the UK music industry and political spectrum. Ed Balls, Secretary of State for Children, Schools and Families said: "Giving young people the chance to learn about music can teach them more than just the ins and outs of an instrument. It forms an integral part of our culture, and I believe it should be an integral part of every childhood. I want the National Year of Music to celebrate our great and diverse musical heritage, to champion our remarkable young talent, and enable more children and young people to experience the fantastic musical opportunities that are on offer in this country." Ed Vaizey, Shadow Minister for Culture said: "It's great to see this industry generated initiative which gets young people involved in songwriting and increases their understanding of the connection between creativity and copyright." Boris Johnson, Mayor of London said, "Live music is integral to London, so to provide opportunities and access for young people into the music industry is vital in keeping London at the cutting edge. Soundsurf 09's tour delivering 'Education through Live Music' is a welcome addition to the music education sector. With creative song writing workshops for schools, advisory clinics with industry professionals that provide advice on career progression and events showcasing local bands, Soundsurf is supporting London's future musicians." Feargal Sharkey, CEO UK Music, said: "This is a fantastic opportunity for young people around the country to learn more about the music industry, to meet other musicians and to flex their creative muscles. The Soundsurf 09 Tour has the full support of UK Music."